My blog hasn’t quite caught up the fact that I now have two jobs to go along with my two lives. 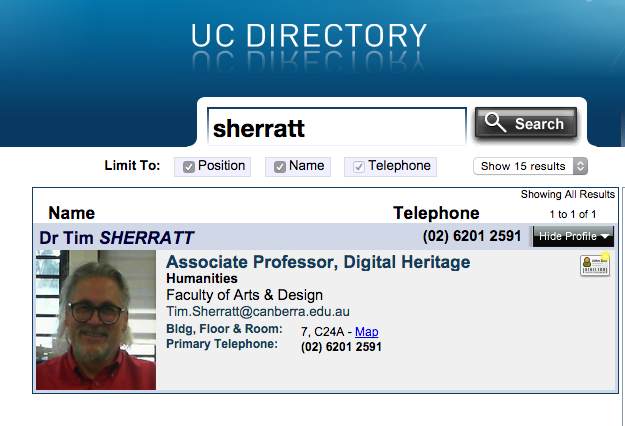 Monday to Wednesday I’m still part of the Trove management team at the National Library of Australia, but on Thursdays and Fridays I’m Associate Professor of Digital Heritage in the Faculty of Arts and Design at the University of Canberra. I love working with the Trove team, but I also want to keep contributing to the development of the digital humanities in Australia through my own teaching and research. Hopefully now I can do both. At the University of Canberra I’ll be helping to develop new digital heritage offerings in undergraduate, postgraduate and professional development courses. Exciting times ahead! On the research front I’m hoping to reinvigorate a few stalled projects and poke around some more amidst the possibilities and politics of digital cultural collections. These are the themes I’m thinking about at the moment. How digitisation projects change our relationship with the past. Trove Traces — more analysis please! Developing new forms of online publication that use Linked Open Data to integrate historical writing and cultural collections. All that in two days a week — wish me luck! The workplace deaths project sounds interesting.